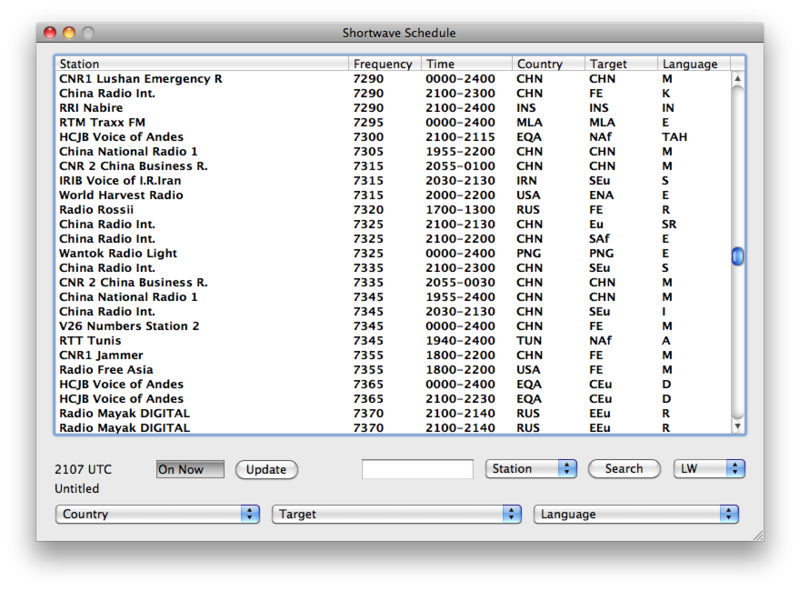 Shortwave Broadcast Schedules helps the SWL find shortwave broadcasts to listen to, as well as identify the station that is tuned in. You can double click on an entry to tune your radio to that frequency. You can also manually tune your radio, and the list of possible broadcasts will scroll along with the frequency, helping you identify the station. It is available for Windows, Mac OS X, as well as linux. This is the first public beta of the app. It is not yet completed, there are more features to add. It also likely has some bugs. Presently, radio control is only implemented for Icom radios using the CI-V interface, as well as the SdrDx SDR app for Windows and Mac OS X. I do plan on adding support for additional radios, this is where users can help, by testing how it works with their radio. If you're interested in doing this, and you already have your radio connected to your computer via a serial cable, let me know what radio(s) you have. There is a ReadMe.rtf documentation file that comes with the download. What a very nice thing. I dont have an SDR or anything fancy - just a simple radio... Will I still be able to use it or only with an SDR program? If you want to use it to control your radio (or be controlled by your radio) you will need a radio that can be controlled by your computer with a serial link. Otherwise, you can always use it manually, without the radio interface, to see what is on. Currently setting up one of my Macs to control a Yaesu FT-840. Have the USB-Serial adapter and the Yaesu RS-232 to TTL interface, but something isn't quite right and can't get the Mac to control the radio. Have an old Perl program I wrote for an FT-817 that used to work fine (with the 817), but its not working with the FT-840 yet. Could be the program, the FT-840, the serial cable, or who knows what. Put in a map with the rx location & the tx locations along with bearings to/from the station. For some distant version of the program, be able to click on a country/region on the map and it picks up all the xmtrs (where region is perhaps a user-defined radius from where someone clicks), along with the great circle path of the signal. However, that info would have to be gathered from HFCC or elsewhere, as EiBi doesn't have it. Lots of possibilities for map-based control/viewing, but considering the program is early beta, I'm sure there's a thing or three that must be done first. With a radio hooked up, the program can poll the radio every second or something, then display station info for the frequency its on. Nice App! I am running Linux Mint 15, a modified Gnome desktop. Minor complaint: The wording in the drop downs is cut off. I have not messed around to see if this can be easily remedied. I have used the DXToolbox app to talk between SDRdx and either the local loopback, or over the LAN. Using the ports specified in SDRdx and DXToolbox, I will see if this works the same for me. Yeah, I will need to see what I can find with station location information. It should do that now, if you have a radio interface set up. Trying out the windows version with a Kenwood TS-450, the software appears to poll the serial ports when config is clicked and puts my transceiver into transmit mode a few times before opening the config window. It does recognize my virtual usb serial ports without a problem. I think the serial/CAT interface to these old Kenwoods is pretty simple, so may be a good place to start. Skeezix has some good ideas for future improvements. Also would like to be able to choose multiple items in the country/target/language filter dropdowns. Also, would be nice to show a list of frequencies parallel to the one selected. My guess is it is asserting the PTT (DTR line) as it enumerates the serial ports in the system. I'll see if there's a way to disable that. Seems to be working well on Windows/SdrDx/NetSDR with the latest update (0.0.1b4). How will the updates occur with the next shortwave schedule? Will we have to re-download the folder or will it query EIBI online in the background. Its "pushing" info to the radio by being able to change frequency, can it "pull" info too? I ask because if it could read what freq you are currently on, and know the time it is, it could give a constant read out of what freq you are on and what station you are listening to. (assuming the freq is in the database) That would be a very nice feature. Tune to a frequency and have it display what the station is. Hey! I guess it already does this, Nice! Thanks for the program, I realize its still in the development stage but it works well. refmo- What do you use to interface between the computer & the 450? I have a TS-690S which is the same thing, but with 6m. The Kenwood IF-232C interface is long since discontinued. Found schematics for building one and a company makes one for $50. The homebrew one uses opto-isolators so the radio & computer are isolated, which is very nice. Its "pushing" info to the radio by being able to change frequency, can it "pull" info too? I ask because if it could read what freq you are currently on, and know the time it is, it could give a constant read out of what freq you are on and what station you are listening to. (assuming the freq is in the database) That would be a very nice feature. Tune to a frequency and have it display what the station is. Right now it is hard coded, but eventually (hopefully shortly) you'll be able to update it, I suspect in two ways: Either with a update button, or by placing a copy of the EIBI CSV file in a certain place. That would allow you to edit the file as well. It's in the app now, but see above. Also, I plan on adding a way to restrict entries by country, target, and language (the iPhone version does that now) which helps in filtering out stuff you are not interested in. This will be in addition to the popup menus to select those criteria. There's also the ability to select the frequency range in the Configuration window, so you can set the lower freq to say 2000 kHz to filter out all the LW and MW stuff. Good idea, let me ask him about that. Yes, It does that now for the SdrDx and Icom interfaces. I am working on the generic serial interface now. Supporting 6.02e+23 different radio protocols would be... daunting. Since, AFAIK, they all seem to be ASCII based, there will be text that the user sets for their particular radio, to describe how to set the frequency, request the frequency, and parse the returned frequency. That's my plan, anyway. We'll see how it works. - If you can use the HFCC DB, give a rough estimate of the propagation of the signals based on time, xmtr location, power, azimuth, and solar data. With the ability to have different sets and assign them to days and/or dates. And it will automatically change the radio. lol good job Chris thanks!! I use the microHam Interface II (it will communicate fine direct to the Kenwoods). I think they have the interface III now. Works well , just hook up the cables, configure a virtual serial port, and start using it. I still occasionally see the IF-232C on QRZ.com, but the microHam works at least as well, and also provides a clean isolated audio interface. Another idea for future versions of the software: implement a 'Favorite' button, so that I can mark the items I am most interested in. And then be able to filter to only show favorites. This would be an easy way to get rid of clutter in the list. Pretty simple stuff - for instance: "FA0006925000;" will set the frequency of VFO A to 6925khz.